I am doing a Betty Swap on Two Peas in a Bucket. We had to send in a soup recipe on a 6 by 6 Page with some embellishments. Here is my card on a pull out tag and pocket page. 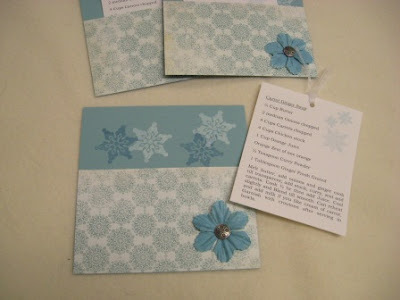 I think there are 20 of us so I will get back 19 other recipes cards that can be made into a book. There are a second part to this swap. I am to send a list of things to a fellow Betty. I Christmas movie, Christmas story, Christmas CD of music, A winter hat scarf set, Some scrape book stuff, A reading Book, I would have to check my list twice. I have made a few things for my partner. I will be getting a package from another Betty partner too. I did this swap last year around Dec. It was a lot of fun.